AFC Blackpool have three games left to secure a play-off spot. Blackpool lost ground in their pursuit of the last Hallmark Security League first division play-off spot thanks to Jack Turnbull’s first-half hat-trick. This was the second of four games in eight days for AFC, who were forced to make changes to the side that beat Cheadle Town 4-2 on Saturday. And they made a disastrous start, conceding a penalty in the first few seconds which Turnbull converted. Struggling to get into the game, Blackpool were outplayed for much of the first half and it was no surprise when Turnbull added his second in the 23rd minute. He completed his treble on the stroke of half-time to give the visitors a commanding lead. 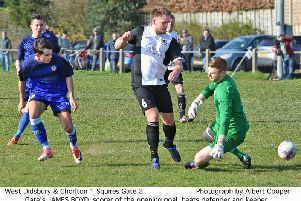 AFC boss Dave Worthington switched to three at the back for the second half and introduced Kit Gregory, who made an impact within five minutes as his low drive beat Chadderton keeper Daniel Havern. With the wind causing problems for both sides, AFC tried hard but couldn’t score again, losing Gregory to a foot injury. Blackpool: Kirkland, Nay, Betteridge, Caunce, Baird, Pickering, Bishop, Hargreaves, Taylor, Williams, Dawson; subs: Gregory, McKenna, Duffield, Mottram, Donaghy.